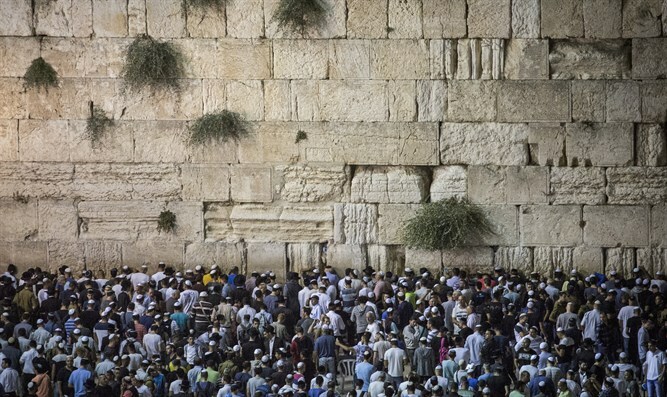 We stand for hours in prayer on the High Holy Days, but how do we know if we are forgiven? Yom Kippur is probably the holiest, most uplifting day of the year. It’s a day of fasting, prayer and closeness to G-d. And after all that, it probably has one of the most anti- climactic endings possible – according to the Rosh (רא"ש), on Motzei Yom Kippur we are obligated to happy. He bases his opinion on the pasuk from Kohelet - ;Go, eat your bread with joy and drink your wine with a glad heart, for G-d has already approved your deeds;. But how can we be so happy? Are we so sure that we are forgiven? At the end of the day, shouldn’t we be somber and worried, not knowing what our judgment will be? In order to answer our question we’ll have to take a look at the whole framework of The High Holidays, from Rosh Chodesh Elul until Yom Kippur. The Yamim Noraim are not a series of unrelated holidays, but rather a process, a spiritual journey we pass through every year. Their structure parallels that of tefilat shacharis that we say every morning. The morning prayers are not a random collection of paragraphs which were cobbled together haphazardly over the centuries, but rather a thought out structure which is meant to lead us through a process, a purposeful movement towards a specified goal. The essence of our intents during prayer is the awareness of being in of G-d’s presence, to consciously stand before G-d. The words we say, the praise and the requests we make are secondary to the awesome experience of merely being in the presence of The Creator. In other words - if you didn’t feel, even for a split second, that you’re standing before G-d, than you didn’t really pray. Now that we’ve defined our goal, we can see how each section of the tefilla is a necessary stage towards our goal. The first step is a preparation before standing before Hashem. In Pesukei Dezimra We bring sections from tehillim (Psalms) in which we are praising G-d, making more salient our awareness of G-d’s greatness. We are reminding ourselves the significance of meeting the almighty G-d. The Shema is the step of accepting the yoke of Hashem’s kingship over the world in general and over me specifically. I’m recognizing G-d as my king. This stage is critical in order to stand before the king, Hashem. Before we can be allowed into the throne room we must accept the sovereignty of the king. Only after that can we reach the ultimate goal and stand before Hashem in the silent prayer. So we have the journey and we have the destination. Pesukei Dezimra and The Shema are the process, the preparation, which allows us to achieve our goal, to stand before Hashem. As was mentioned above, the high holidays were built in the same format as our tefilot. The moth of Elul is parallel to Pesukei Dezimra - the time to come closer to the king, to recognize his greatness as he comes out of the palace to meet us. Rosh Hashana, the day of G-d’s coronation, is parallel to Shema. We recognize G-d’s kingship, and along with it – the infinite distance between us and our king. We are all standing in the royal courtyard, knocking on the king’s door, asking to be let into the divine presence. "For on this day he shall provide atonement for you to cleanse you; from all your sins before Hashem shall you be cleansed"
It is an entire day of just being there, of standing in the divine presence. The Avoda, the service in the Temple, on Yom Kippur expresses just that – the epitome of the day is when the Cohen Gadol enters the inner sanctuary and stands, as an emissary of all of Am Yisrael, before G-d. When we find G-d in our world, when G-d is present in our consciousness, then we are standing before him. The more we feel G-d’s presence, the more he is a salient part of our lives – the farther away we are from sin. Just standing before the infinite Lord cleanses us. His holy light shines into all the nooks and crannies that we have darkened throughout the year. We can now answer our opening question – how can we know if I had a ‘good’ Yom Kipuur? How can we know if our sins were atoned? If we felt that we were standing in Hashem's presence, then we were in his presence. If we were in his presence we can be confident that our sins were washed away, and we know had a ‘good’ Yom Kippur. Torah MiTzion was established in 1995 with the goal of strengthening Jewish communities around the globe and infusing them with love for Torah, the Jewish People and the State of Israel. Over the past twenty two years, More than 1300 shlichim have inspired and enriched their host communities through high impact formal and informal educational programs.